Some young men lead charmed lives. Monte Kinasz did not. 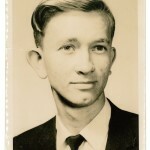 Born in 1947 to Steve Kinasz and Annie Clifford, his mother died only five months after his birth and his father abandoned his young son in January 1948 and moved to Arkansas. Monte was left in the care of his grandparents Paul and Mary Clifford who were farmers in Spalding County. Times were hard and money was scarce but the family was a close one. Uncles, aunts, cousins usually visited and ate together on Sundays after church around a table groaning with food produced on the farm. The family was very active in their church. Like any farm boy of that era, Monte had many chores that he was expected to do. When he had time from his work he spent it in the creeks and woods with his cousin Harold Hasler who lived nearby and was more of a brother than a cousin. Monte and Harold attended Aiken Elementary. It was a two room school house. Three grades in each room. From there they went on to Spalding Junior High and Griffin High but the after school chores didn’t get any fewer nor easier. H did enjoy being in the D.C.T. and French Clubs but after school there was no time or money for a social life centered around soda fountains or dances. When Monte turned sixteen and could get hired he went to work at a cotton mill as a “picker.” His days were spent going to school from 8:00 till 3:00 then working the second shift from 4:00 till midnight, getting home, doing his homework and then getting up the next morning and doing it all over again. But Monte was different from many of his contemporaries who thought they had no option but to work at the mill and just get by. He realized the value of an education. He knew where it could take him and that ‘s where he wanted to go. What money he didn’t give to his grandparents to help with the bills Monte split between an old car and saving so he could one day go to college. And that is what he did. 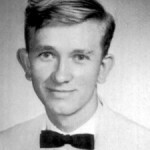 When he graduated from high school he enrolled at Georgia Southwestern in Americus. But the savings ran out and he dropped out of college to work at the mill for money to enroll again. However during the quarter he was out of school his number came up. He was drafted. Definitely unhappy about being drafted, Monte nevertheless accepted the situation determined to do his duty and come back to complete his education. But fate intervened yet again. 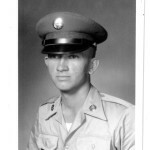 He entered the service May 18, 1967 and was sent to Vietnam October 20 of that year as an Armor Reconnaissance Specialist. He was stationed near Hua Nghia South Vietnam when he was fatally wounded in a grenade attack during the North Vietnamese Tet Offensive. In his last letter home Pfc. Kinasz was fatalistic. “This is to let you know I am well. But I don’t know for how long. The fighting is getting worse around Saigon. I couldn’t count how many have been wounded in my platoon since this all started. Yesterday we were attacked while passing through a village not far from here. This isn’t the first time but during this one the fighting was so fierce we had to pull back and leave one of our wounded for the enemy. As of today I have spent 4 months and 9 days in country. I sometimes wonder if I will make it without getting killed or wounded. The chances are heavily against me. We have a very high casualty percentage even higher than the infantry. But maybe I shouldn’t be telling you this. I’m sleepy so I guess I’ll close for now. Say hello to the rest of the family for me. Pfc. Monte Kinasz was survived by two aunts, two uncles and several cousins. He is buried in Mount Zion United Methodist Church Cemetery, Zetella, Spalding County Georgia.